How can I go about that. must be related to some ‘lightbox’ plugin, try disable them. How do I remove some stuff from the sidebar? I would like to remove the widgets of Meta, Categories, Pages, etc, and also the footer widgets, but they don’t seem to be anywhere in the widgets page. Any idea? 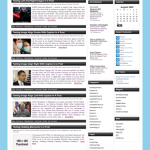 This wordpress theme does look great, I think I will use it on one of my sites soon! Thanks for the share/download. Keep it up!